What if your child falls, bumps his head or injures his knee? Your child is very upset, what do you do next? Do you have the right medical supplies and information for their injuries? 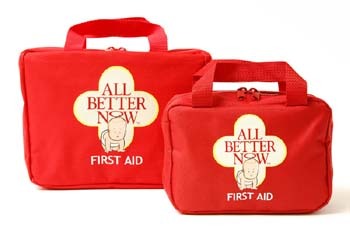 All Better NowTM are premium First Aid Kits designed and assembled in NZ for use with infants and children up to 12 years of age, yet most of the contents can be used by the whole family. These comprehensive, compact and portable kits were designed by a Registered Nurse and mother, in conjunction with a leading paediatric specialist. The carefully selected contents equip parents and caregivers for a wide range of common infant and childhood situations so they can be confident they are prepared, even for emergencies.